Brewer C. E., V. C. Bleich, J. A. Foster, T. Hosch-Hebdon, D. E. McWhirter, E. M. Rominger, M. W. Wagner, and B. P. Wiedmann. 2014. Bighorn sheep: conservation challenges and management strategies for the 21st century. Wild Sheep Working Group, Western Association of Fish and Wildlife Agencies, Cheyenne, Wyoming, USA. We received a large cash donation a few years ago to name a new wildlife water system after N ancy Andrew. Nancy Andrew was a strong advocate for bighorn sheep when the American Canal was lined with concrete. Her knowledge and position as DFG biologist allowed her to drive the requirement to fence the canal (to prevent wildlife drownings) and to make water available to wildlife outside the fence as replacement for lost access. SCBS cooperated with a local property owner and were able to locate the new system near Amboy California. The owner was very helpful and did the rough grading with their heavy equipment and also partially buried the 2 new tanks. That saved us a huge amount of work. We used 2 of the newest SCBS designed direct burial tanks. The remainder of the work was performed by SCBS, including finish grading, plumbing, laying the Hypalon rain collection mat and installing a dedication plaque. It took us a few trips to the site to finish all of the work. We installed an infrared trail camera at the site and had photos of sheep using the new system. After 60 years of resistance, SCBS has finally purchased our own vehicle. Previously, we had been using DFG (now DOW) vehicles under our volunteer service agreement. However, due to the sorry state of the California budget, DFG has not dedicated appropriate funding to maintain and upgrade the DFG vehicles at Camp Cady. The GMC truck was headed to Bishop for a new set of tires last summer but had a blowout and the subsequent damage was beyond repair - the DFG retired that vehicle. The motor pool has steadily dwindled over the years from 3 vehicles to 1 Dodge that only works part of the time. We felt as the board, that it was asking too much of our volunteers to use their personal vehicles without at least putting in some SCBS funds. 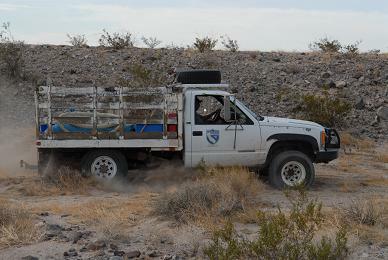 Furthermore, few volunteers have the appropriate vehicle to haul water, pumps and tools. 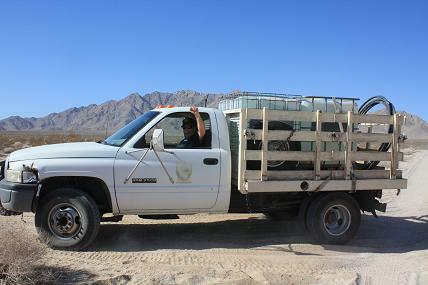 We needed a 1 ton flat bed truck like the DFG vehicles. Through some last minute phone calls, board member Terry Anderson secured a significant donation to purchase the SCBS truck. 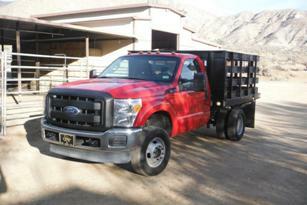 We managed to find a 2011 Ford F350 with dual rear wheels and a stakebed. Although it has the V10 and not the more efficient diesel, it was a great bargain. Many thanks to Mark Dickson for the very generous donation! Now that we own our own vehicle there are a host of additional costs associated – insurance, fuel and maintenance being the primary ones. 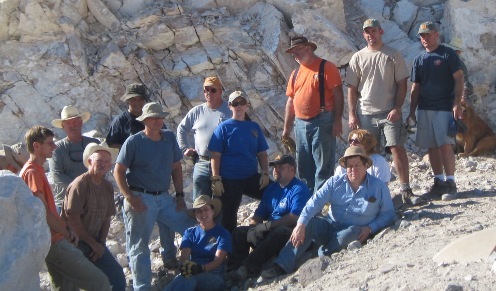 If you would like to help support our mission of Desert Bighorn Sheep conservation please consider making a donation to the vehicle maintenance fund.